New Delhi : India's Prime Minister Narendra Modi is surely a talented man, he has done many things which create records by themselves. But, this is related to something which he had donned; his suit with his name embedded on cloth has entered the Guinness book of world records. 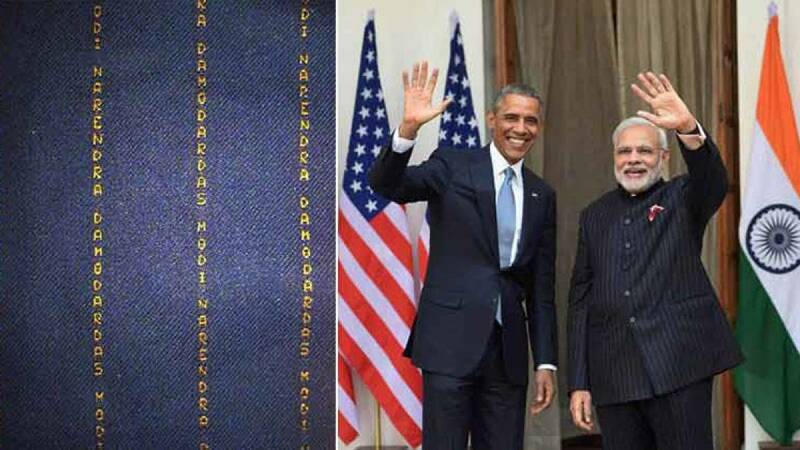 # Prime Minister Narendra Modi's special suit which he had worn during his meeting with US President Barack Obama in New Delhi has entered Guinness Book of World records. # In February this year, the suit was sold to a Surat businessman for a whopping amount of Rs 4.3 crores, making it the most expensive suit ever auctioned. # Laljibhai Tulsibai Patel shelled out exactly Rs 4,31,31,311 for the suit which was actually made at a price of mere Rs 10 lakhs, and was given a base auction price of Rs 11 lakh. # Last year, PM Modi's monogrammed, pinstriped, 'bandh gala' suit made headlines because of a very specific sartorial feature - its stripes were made of repetitions of a single motif: the Prime Minister's name, Narendra Damodardas Modi. It was stitched by Jade Blue, an Ahmedabad-based garments chain.